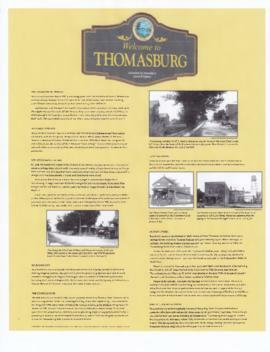 Scanned photographs of buildings in Thomasburg, Ontario and a digital copy of a poster describing the history of the town. File contains a newspaper clipping from 1969 about Rebekah Lodges in Belleville, Stirling, and Thomasburg being visited by Provincial Assembly President. File contains several newspaper articles about the 100th & 101st Anniversary celebrations of Thomasburg United Church, as well as articles about the fire in 1963 that destroyed the church; and 1965 about the dedication of the new church. Printed illustrated memoir and genealogy of Guy Wilson Thompson of Thomasburg, Ontario.